This recipe yields extra for post-workout snacks. “In addition to containing all nine essential amino acids, quinoa has gut-friendly fiber,” says Lauren Blake, RD, Columbus Ohio-based recipe developer and founder of Whole Living Lauren. Using a strainer, rinse the quinoa under cold water. Add quinoa and 2 cups of water to a medium saucepan and bring to a boil over medium-high heat. Once boiling, cover and turn the heat to low. Let simmer for about 15 minutes, or until water is fully absorbed; remove from heat and fluff with a fork. In a small bowl, whisk the lime juice, honey, and mint together until fully combined; transfer to an airtight container. In a separate airtight container, combine quinoa, blueberries, raspberries, and oranges; store everything in the fridge. 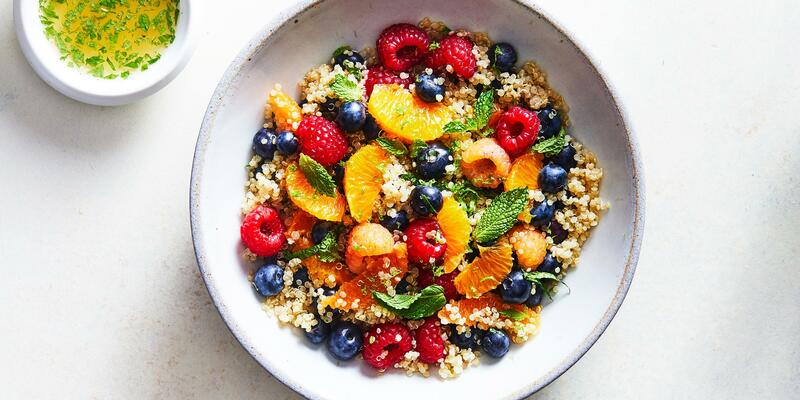 Place the quinoa and fruit salad in a bowl and dress with lime-honey-mint mixture.